Jade E-Services Singapore Pte. 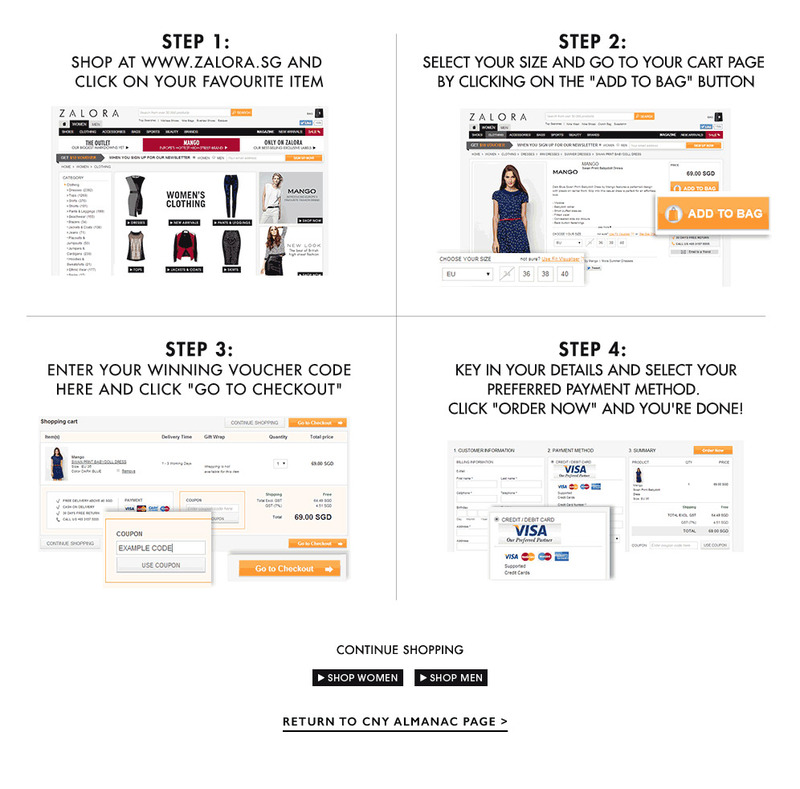 Ltd. (ZALORA Singapore) maintains this web site ("Web Site") and is responsible for this promotion. You can access and use this Web Site only if you agree to and accept the following terms and conditions applying to your use ("Terms and Conditions") without limitation or reservation. Please read these Terms and Conditions carefully before accessing and browsing this Web Site. You may download material displayed on the Web Site for your non-commercial, personal use only. Additionally, you may not modify, reuse, report, or use the contents of the Web Site for public or commercial purposes, including the text, images, audio, and video without Jade E-Services Singapore Pte. Ltd.’s written permission. Jade E-Services Singapore Pte. Ltd. reserves the right to cancel or amend the promotions mentioned on the Web Site or these Terms and Conditions at any time without prior notice. Any changes will be posted either within the Website or these Terms and Conditions. The Promotion is valid from 9 February 2015 to 28 February 2015, or while stocks last, only at www.zalora.sg and www.tigerair.com respectively. All prizes must be redeemed by 31 March 2015, 23:59:59. Failure to do so will result in the forfeit of prizes. Jade E-Services Pte. Ltd. and tigerair reserve the right to disqualify all winners that do not meet the rules and regulations of the 2015 Travel Almanac Promotion. These include hacking, code mining or any other means of interference or attempt to interfere with the Platform, or any activities on the Platform. You agree not to obtain or attempt to obtain any materials or information through any means not intentionally made available through the platform. You agree neither to modify the platform in any manner or form, nor to use modified versions of the platform, including, without limitation, for the purpose of obtaining unauthorized access to the platform. You also agree that you will not use any robot, spider, scraper or any other automated means to access the platform for any purpose. Failure to comply will result in the forfeit of prizes. Prizes are non-transferable and non-exchangeable for cash. Value of the prizes may vary; Jade E-Services Singapore Pte. Ltd. and tigerair reserve the right to replace any prizes with items of similar value without prior notice. Jade E-Services Singapore Pte. Ltd. and tigerair reserve the right to terminate, amend or extend this promotion in the event of exceptional circumstances outside its control which affect its ability to operate the promotion. Acceptance of any prize shall constitute consent on the winner's part to allow the use of the winner's name, image, voice and/or likeness by Jade E-Services Singapore Pte. Ltd. for editorial, advertising, promotional, marketing and/or other purposes without further compensation except where prohibited by law. Acceptance of any prize shall constitute a release and discharge of Jade E-Services Singapore Pte. Ltd. by each winner from any and all liability, claims, demands, causes of action, and/or damages which the winner may have, whether known or unknown at the present time, of any nature whatsoever, arising out of or relating to: (i) the contest, (ii) personal injury and/or property damage, theft or loss suffered by the winner as a result of the use and/or enjoyment of the prize, and/or (iii) any tax liabilities in relation to the contest, prize and/or use or enjoyment of the same. The Grand Winner of the contest may be announced on www.zalora.sg or official social media pages. The Grand winner will also be notified separately by email or telephone and will be required to acknowledge by return email latest by 7 March 2015. Jade E-Services Singapore Pte. Ltd. reserves the right to deal with all unclaimed prizes in any manner deemed fit. Subject to the terms and conditions herein, there will be only one grand winner. The grand winner shall receive one year supply of shoes (12 pairs in total). 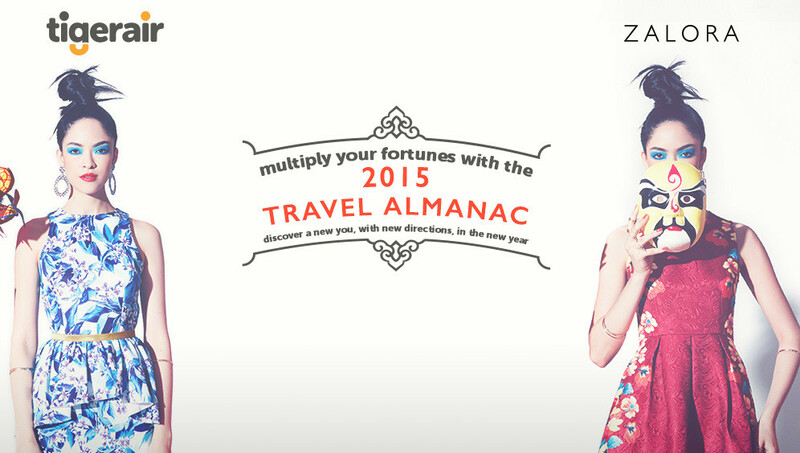 Winner must produce proof of identity and the physical 2015 Travel Almanac Grand Prize eDM upon the prize collection at Jade E-Services Singapore Pte. Ltd.’s office currently located at 182 Clemenceau Avenue, #03-01, Singapore 239923 (as of 2 February 2015). In the event that any participant is disqualified from the Promotion, Jade E-Services Singapore Pte. Ltd. at its sole discretion may decide whether a replacement entrant should be selected. In this event, any further entrant will be selected on the same criteria as the original entrant and will be subject to the Terms and Conditions. Grand prize not collected by 15 March 2015 shall be disposed of at Jade E-Service Pte. Ltd’s sole discretion. Jade E-Services Singapore Pte. Ltd.’s decision regarding the award of all prizes, and/or in every situation including any not covered in these Terms and Conditions, shall be final and binding on all participants in the contest, and no queries, challenges or appeals may be made or entertained regarding Jade E-Services Singapore Pte. Ltd’s decision on the same. The receipt by any winner of any prize under this Contest is conditional upon compliance with any and all applicable laws, rules and regulations. All other prizes must be redeemed by 31 March 2015, or they will be forfeited. All prizes are subjected to their individual terms and conditions. Prizes involving discounts are (a) valid only on full-priced items (b) not applicable on selected non-sale brands stated at www.zalora.sg/faq-non-sale and are subject to changes (c) valid for one time use only for each registered user at www.zalora.sg . Prizes involving gift vouchers are (a) valid for one-time use only for each registered customer at www.zalora.sg (b) not valid in conjunction with other promotions or discount codes and (c) is applicable on full-priced items only. Jade E-Services Pte. Ltd. reserves the right to change the terms and conditions, or cancel any promotion, at any time without notice. Jade E-Services Singapore Pte. Ltd. cannot accept any responsibility for any damage, loss, injury or disappointment suffered by any entrant entering the Contest or as a result of entering the Contest or accepting any prize. Jade E-Services Singapore Pte. Ltd. is not responsible for any safe custody, return, non-delivery or missing of entries, late, misdirected, problems or technical malfunction of any telephone network or lines, computer on-line systems, servers, or providers, computer equipment, software failure of any email or entry to be received on account of technical problems or traffic congestion on the Internet, telephone lines or at any web site, or any combination thereof, including any injury or damage to entrant's or any other person's computer or mobile telephone related to or resulting from participation or downloading any materials in the Contest. By entering the Contest or accepting the prizes, You agree that no claim relating to such losses or injuries (including special, indirect and consequential losses) shall be asserted against Jade E-Services Singapore Pte. Ltd., its parent companies, affiliates, directors, officers, employees or agents from any and all losses, damages, rights, claims and actions of any kind resulting from the Contest and acceptance of any prize, including without limitation, personal injuries, death and property damage. to the use of your answers to the questions and/or tie breaker for Jade E-Services Singapore Pte. Ltd’s promotional and marketing purposes. Jade E-Services Singapore Pte. Ltd and its affiliated companies respect the privacy of every individual who visits our Web site or responds to our advertisements and contest.